It was the summer of 2013 and the people of Ukraine felt helpless. During this time of ‘soft authoritarianism,’ they saw rampant corruption while corporations and other business interests enjoyed a privileged place in the center of Ukrainian politics. The highly centralized state apparatus, controlled by one political and business ‘family’, made public influence over policy-making ineffective. Frustrated with meaningless mechanisms to participate in political decision-making and suffering from economic hardships, those unhappy with the status quo demanded social change with the contentious means. While the right to political participation is guaranteed by the Constitution, Ukrainian democracy’s various mechanisms, such as public hearings or public councils, remained weak and did not bring the desired results. The government’s order to reverse the foreign policy course on European integration was a last straw. 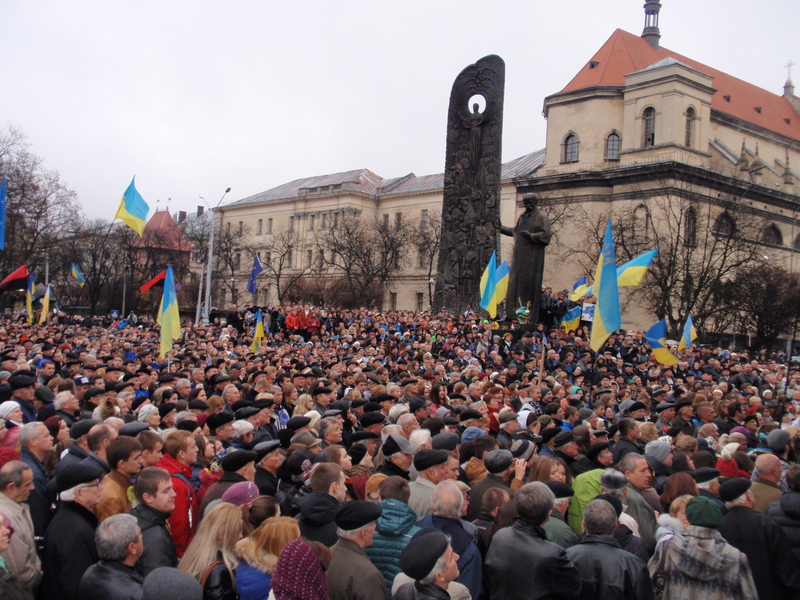 Ukrainians marched onto public squares in Kyiv and in towns and villages throughout the nation. It was the Maidan protest movement, and what was called the Revolution of Dignity. (1) How did the claimants identify themselves and their actions? (2) How did they justify their actions? (3) What did the claimants want? • Protestors, or “claimants” in the language of Contentious Politics (Tilly and Tarrow 2007) primarily identified with their right to direct democracy, including influence over national and local policies. Activists associated themselves with the popular assemblies, or ‘viches.’ The viches proclaimed their legitimate right to exist and promoted the decisions they adopted. • The claimants framed their actions as a legitimate non-violent civic resistance campaign. They perceived themselves as “civil society in action,” guarding the country’s democracy by monitoring the government’s conduct of foreign policy and European integration, implementation of human rights, and protection of constitutional rights for peaceful assembly. • National-level factors played a key role in leading people to the streets. Outrageous human rights violations, a deepening political crisis, and major institutional failures were, to the claimants, the key triggers of contention. To address these problems, protesters demanded resignations of top national officials and snap elections of the president and the parliament. The desired changes included change in the ranks of the political elite and a significant transformation of political structures. Protesters issued further specific demands of increased public oversight and more meaningful and effective institutions of political participation. This included direct democracy, designed to enhance everyday citizen impact on political decisions. This is based on the article “Who Were the Protestors and What Did They Want? Contentious Politics of Local Maidans across Ukraine, 2013-2014”, published in Demokratizatsiya: The Journal of Post-Soviet Democratization, issue 23 (4) Fall 2015: 379-400. Olga Zelinska is a PhD student at the Polish Academy of Sciences. She is currently a Petro Jacyk Visiting International Graduate Student at the Center of European, Russian and Eurasian Studies at the University of Toronto.